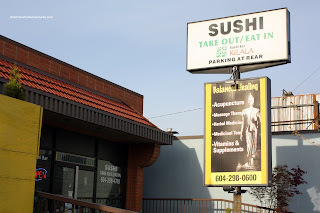 The first time I ever laid eyes on Kilala Sushi, I could not make out the actual name of place. 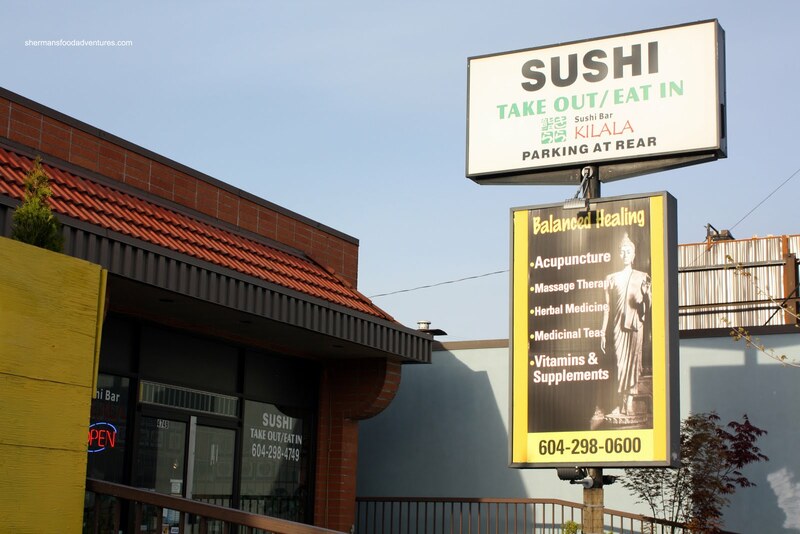 In big letters "SUSHI" is quite evident; but "Kilala" almost seems like an afterthought. Thus, I merely ignored the place thinking that it was some cheesy joint. You know the kind. The kind that has the sign that exclaims "CANADIAN-CHINESE FOOD"; but you would never be able to figure out the name. So, I essentially avoided the place like it was Knight & Day. Well, how wrong was I. According to a friend, it is a true sushi bar run by a Japanese couple. Despite this, I still did not flock to it immediately. I was nearby once and att empted to eat there; but one look at the menu, it was obvious that I had to come without the kiddies. Other than a few donburis, it is strictly a sushi bar. 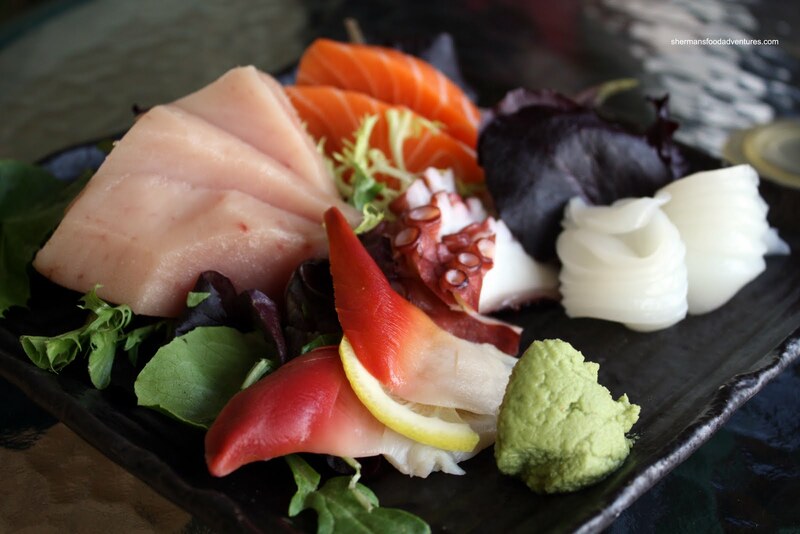 So it was only natural we started with a plate of Assorted Sashimi. Now, I'm not a big stickler for small details; but do you notice anything strange about the presentation? If you answered, "What's with the spring mix??? ", you are right. Normally, there would be julienned daikon. Not a huge problem; but I do like eating the daikon with my sashimi. And about that sashimi, it was pretty good . The tuna was a tad on the mushy side (well, tuna is a bit mushy in general), while all the other textures were what they should be. We particularly liked the tako since it was not that chewy while still exhibiting a nice snap. With the obligatory "have to try the sushi rice here", we ordered some Nigiri and a Scallop & Tobiko Roll. We got one piece each of inari, tuna, wild salmon, scallop and unagi. I though the rice was slightly on the drier side; but other than that, it was pretty good. Each grain of rice was discernible without being hard. I could taste the vinegar, which to me is not readily the case here in the GVRD. The good sushi rice made for a good roll as well. The nicely toasted sesame seeds added a nice aromatic flavour. 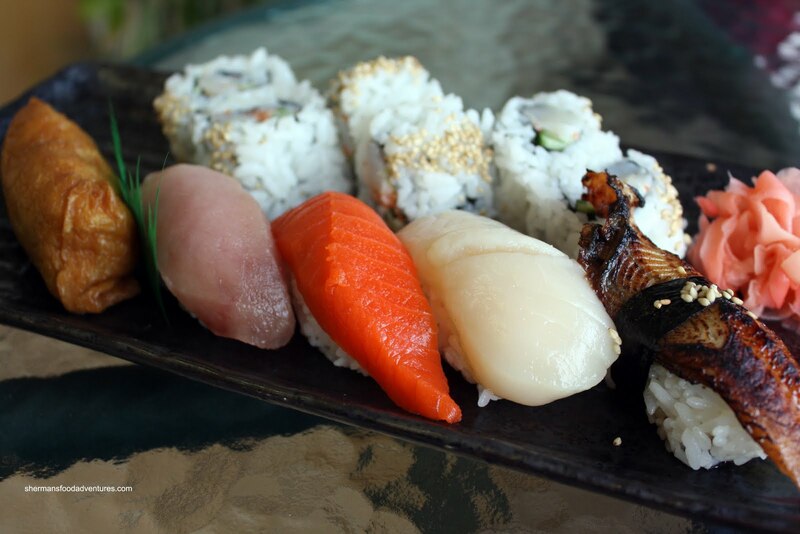 One item that we normally don't find in Japanese restaurants in the GVRD is Oshizushi or pressed sushi. The only other time I've had this is at Koko. 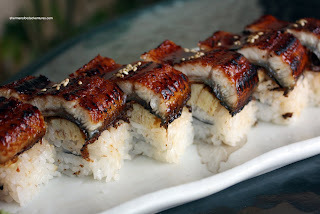 We went for the Unagi Battera this time around and it was neat to watch them torch the unagi, the caramelization added some really good flavour. With some tamago underneath and the good sushi rice, we enjoyed it very much. In fact, the meal in general was pretty good. Considering that the place is essentially a hole-in-the-wall, it was a definite surprise. I wouldn't necessarily drive all the way here if you didn't live in the area; but if you are, give it a try. Hey the food looks good and the presentation surprises me! How much was your one ravioli? It looks good, but it looks like a one-biter kinda thing..is this a "I need to go to McDonald's after" place? I believe Sushi Hachi in Richmond also does oshizushi (pressed sushi). Kim, yah I liked the food here. Give it a try sometime. i've never had pressed sushi, it doesn't seem to be all that common in vancouver? it looks pretty... much better than the sloppy rolls you sometimes see. Trisha, pressed sushi can be good. I had the one at Koko and was only moderately happy with it. However, the one here was really good. A nice balance of rice, tamago and unagi. Bias being put aside, because my friend's family actually owns the restaurant. It is strictly sushi which I believe are common in Japan, same with Robata restaurants. So I wouldn't say it is a bad thing if it doesn't have a lot of cooked food. Oh, I totally agree. I'm fully aware that most of our "sushi bars" here should not being serving cooked food and it is not necessarily a bad per se. However, given the local expectations and views of what type of food is found here in a Japanese restaurant, it can be a negative for some people. For me, I don't really care about the cooked stuff anyways. We usually order the party tray to take-out for small family gatherings several times a year. The sushi here has been consistently good. The preparation is fine and fish is always fresh. It's a little more pricier than some of the neighboring places that are run like factories, but given the smaller (ma & pa) operation and good attention to details, we find the higher cost well worth it. Thanks to you, I now have a new favourite restaurant. Kilala was awesome! @Y U're welcome! Happy eatings!